Spider-Girls #3 Review – AiPT! When I reviewed the final volume of The Amazing Spider-Man: Renew Your Vows a few weeks ago, I expressed frustration there was no finite ending for the story of Annie Parker from Earth-18199, a character I love very much. I also expressed hope that we might approach something like a conclusion in this Spider-Geddon tie-in, Spider-Girls across its three issues, as imperfect a place for a story like that might be. With this, a saccharine and sincere send off for Annie, and with concessions that we can’t include Normie, Peter and MJ all, we’ve got probably the best we’ll get — as well as a great tie-in in and of itself. That’s by no means a small task for our burgeoning hero, and Annie doesn’t always do the best under pressure as it is. However, Houser writes this issue with a sincerity and singular focus that makes things feel sensible and sound – even if this perhaps the most important, lore-heavy Spider-Geddontie in of them all. 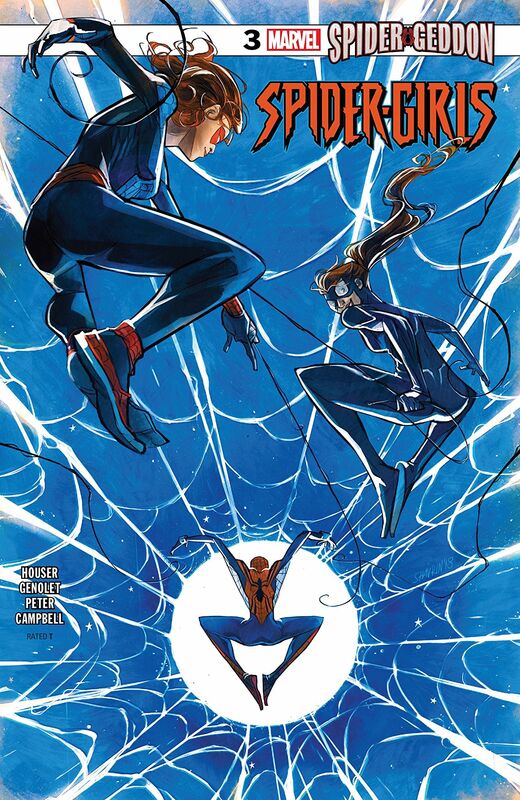 Framed by an honest, earnest narration from Annie, as well as founded in great and funny interactions between the Spider-Girl trio, the issue makes quick work of the Inheritor problem, introduces some fantastic additions to the Spider-totem lore, ties up some ‘Geddon loose ends, and then steps back to give Annie some breathing room. It’s a tightly scripted affair that certainly buckles a bit under all of its callings, but understandably and forgivably so. Especially, because the final focus on Annie is a great, honest look at a character both in macro and micro. Where she has struggled with just her own place in herodom amid her own family, she has now been thrown into this larger thing, this war between Spider and Vampire – how does someone respond to that? Houser writes the reaction, and summary solution surprisingly well and simply, and in a way that I don’t want to spoil, but that also feels totally honest to the character. Here she is, in spite of everything, as part of a bigger picture, and that’s all deserved. Maybe all Annie needed, maybe all any hero really needs, is a purpose. The art meets those demands well, too. Flitting between fluid and expressive, the effect here feels light and fun like most of the Renew Your Vows books have, but also slightly more serious and severe, in great keeping with Spider-Geddon as well. I particularly like the tendency this issue, as well as the series in general, has employed in utilizing these bright oranges, pinks and purples which feel very unique to Earth-18199. All said and done, there’s a bit of a lopsidedness to the narrative that’s unmistakable, and there’s no real threat presented by the Inheritors (save for Spider-Force, it hardly feels like there ever is) but the message, as well as who it’s for, Annie, and us, is imparted so well that I can’t help but be endeared to this effort. Here’s hoping we see more of her and family at some point in the future. A saccharine Spider-Girls finale fits a dual purpose as a secret Renew Your Vows send-off and while it doesn't check all of the boxes in service to both Spider-Geddon tie-in and its own story, what's here is far and away enough for most. Houser writes a really natural, sometimes bombastic, sometimes controlled humor that is rarely honed this well. The send-off for Annie is great, character-focused work that finds a fitting way to close out her story in the Spider-Verse well. The colors and art really pop in a married, fun but serious style. The Inheritors really serve no purpose, and their inclusion feels featureless.